Storyline: Seventeen years after a failed attempt at stopping global warming freezes all of Planet Earth, the sole survivors live on a perpetually-moving train. The train’s cruel class system sparks a rebellion on board, and things start to get dangerous. This film is intelligent, frightening, action-packed, and an overall great experience. 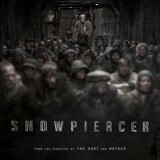 There are some very intriguing characters on board the Snowpiercer, but we don’t get to learn enough about them. The Snowpiercer is an enormous train that circles the globe using a perpetual-motion engine. Seventeen years ago, a chemical was released into Earth’s atmosphere with the intention of stopping global warming. The experiment backfired, freezing the planet and ending almost all life. Now the remainder of humanity is aboard the Snowpiercer; the elite, paying passengers live in the front, and refugees from the environmental disaster in the rear. The class system is clear and brutal, with the rear passengers living on protein bars and enduring harsh punishments for any transgression, while those in the front live a life of luxury. Snowpiercer was built and is driven by the hallowed Wilford, who supposedly resides in the very front of the train. The movie starts with Curtis (Evans) launching a rebellion against the front passengers. This includes releasing one of the original engineers, Namgoong Minsu (Song), who can open all the doors between carriages. As the revolt progresses, things get increasingly more brutal and unpleasant truths emerge about the train. Based on a French graphic novel called Le Transperceneige, this film puts a new spin on the theme of survivors struggling after an apocalypse. The confined nature of the train leaves our protagonists very few options: go forward or go back, unless you want to go outside and freeze to death. This lends the film a particular sense of claustrophobic urgency, and leads to all manner of speculation about how the passengers retain their sanity. It also adds to the atmosphere of fear and subservience that Swinton’s Minister Mason works so hard to maintain. Snowpiercer starts off combining a post-apocalyptic plot with one about a revolution, and gradually evolves into a study of humanity, survival, and how people lose the former in pursuit of the latter. It remains compelling throughout. The characters in Snowpiercer are fantastic, and my only complaint is that we don’t get to know them better. Aside from revolution leader Curtis – and to some extent his mentor Gilliam (Hurt) – we learn very little about the people we are watching. Of course a lot of this has to do with time, and there are subtle insights into the nature of each character, but there remains a sense that there is a teasing and intriguing back story to many of these people we never see. This is a shame, because you will root for the passengers in the “tail” from the very beginning; it would be nice to learn more about them. You might think that setting a movie on a train was going to make for some boring visuals, but Bong Joon-ho makes the absolute most of the setting. There is a dazzling range of train cars, and the glimpses of the frozen wasteland outside the train are both literally and figuratively chilling. The sights don’t end there: the punishment inflicted on disobedient tail passengers is starkly and gruesomely portrayed, and Minister Mason’s ill-fitting false teeth will make you wince. Every detail of this film has been worked out exhaustively, and it shows. Fans of science fiction will love Snowpiercer, as will anyone who enjoys creative filmmaking with an independent feel. It blends sci-fi, action, horror, and human drama excellently, and will leave you asking questions and thinking about life on the Snowpiercer for days afterwards. If you are looking for intimate character studies or optimism then this film may not be for you, but it is a great viewing experience nonetheless. Find the most competitive price for Snowpiercer in the table below. If viewing from a mobile device please click on + to get more information.